Postcard Advent Calendar, December 22: My Fair Lady Wishes You A Happy Christmas! 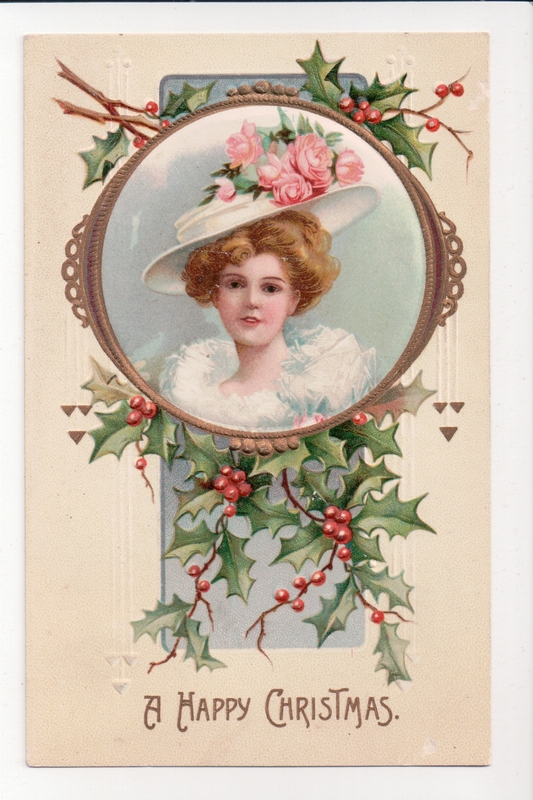 This fair lady sends greetings for a Happy Christmas on this ninth day of my Minor Postcard Advent Calendar. Seven year old Donald C. Minor received this card at Christmastime 1909, and though the painting is not signed, I believe it to be another Ellen H. Clapsaddle card. Why? An embossed frame of gold holds the portrait of a sweet young lady, hair swept stylishly up and under a hat bedecked with fresh roses. A ruffled collar frames a face full of youthful innocence. Such a joyful illustration of Victorian youth is characteristic of Ellen H. Clapsaddle’s work. The International Art Publishing Company was established in 1895, merging companies formerly run by Messrs. Wolf and Samuel Garre. Their most prolific artist was Ellen H. Clapsaddle, as I discovered while researching Skating to Greet YOU!, a card also printed in 1909. Until a collector convinces me otherwise, I stand on my judgement: My Fair Lady is a Clapsaddle original. Happy Christmas! Previous Article Postcard Advent Calendar, December 21: Skating To Greet YOU! so, you’re getting to be a discerning expert at this! your joy is evident in your writing. And Merry Christmas to you, Kay! Isn’t that something? I am astounded by the grip family documents have on my imagination, and by the drive to understand them. Writing about it all is very definitely a joy! Thank you.